Aerojet Rocketdyne, a subsidiary of Aerojet Rocketdyne Holdings, Inc. (NYSE:AJRD), tested its fourth RS-25 engine controller at NASA's Stennis Space Center — the engine controller is needed for the inaugural flight of NASA's Space Launch System (SLS) during Exploration Mission-1 (EM-1), which is slated to debut in 2019 — according to the company, SLS will be the world's most powerful and versatile rocket. 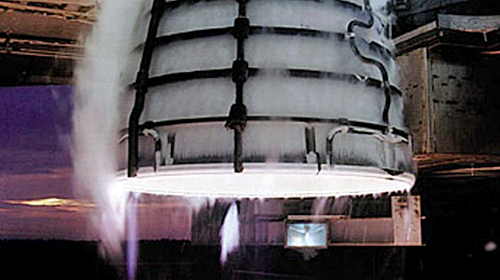 A test firing of Aerojet Rocketdyne's RS-25 engine. Photo is courtesy of the company. Four RS-25 main engines built by Aerojet Rocketdyne provide more than two million pounds of thrust for the first stage of the SLS rocket. These are the world's most reliable rocket engines, with 14 of 16 assigned to the SLS program having previously flown on the Space Shuttle. NASA and Aerojet Rocketdyne are testing the RS-25 engines to confirm they can withstand the SLS flight environment as well as certifying the new engine controllers. Aerojet Rocketdyne CEO and President Eileen Drake noted that the SLS rocket will enable missions no other current rocket can, such as landing humans on Mars and sending large science payloads to other planets in record time. This is the rocket the nation will rely on for decades.